The compact 700 bar cylinders from Enerpac used to tension rigging on yachts including Americas Cup contenders are the same rugged cylinders used by industry to hoist huge weights and to press, pull, form, fabricate and maintain plant and equipment ranging from bridges and buildings to trucks, turbines and production machinery. 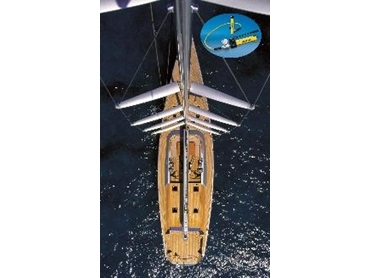 Cylinders of up to 100 tonnes capacity each are used by Rig Pro at the base of the masts of these thoroughbreds of the ocean, operating in pairs to lower the mast by as much as 330mm (13 inches) to take the tension off the rigging while its configuration is tuned for maximum performance from the yachts’ sails. They are then jacked up, just as in industrial applications, and the mast is locked off in the raised position with shims to hold it in place. To save weight in racing yachts, the cylinders can be detached and stored for the next time they are needed. “Use of hydraulic tensioning technology has become very common over the last decade or two,” says Rig Pro’s Scott Simpson. Enerpac New Zealand Territory Manager Neville Stuart says applications such as Rig Pro’s demand the same power, quality and reliability as the toughest industrial applications. “It is a great comment on the quality of the product that it can function in a marine environment for years and still deliver the goods. People probably don’t appreciate that their everyday Enerpac cylinders are the same ones used in some of the world’s most demanding environments – on oil rigs, for example, or even underwater on harbour tunnels and pipelines.